Spamalot cocktail #5. Now we come to the king. Shake with ice and strain into coupe. Dust with cinnamon. Lots going on here, but I had a lot of ground to cover. Mr. Chapman, good for him, was a recovering alcoholic in the end, but during Holy Grail apparently was often plastered. In an interview I saw he mentioned that at his worst he was drinking four pints of gin a day. Holy… grail. 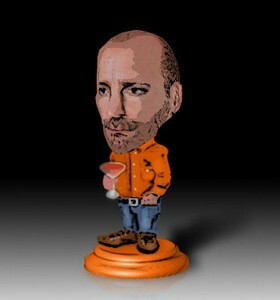 There is something that is wrong about even creating a drink for him. Which is why I think he would approve. So we start with some gin, Plymouth, which I think is decent and military. Under that is something a little fruity (I love the story that when a female fan was appalled to find out that one of the Pythons was gay — Mr. Chapman being one of the first celebrities to publicly come out — Eric Idle responded to them in a letter that the other Pythons had found out who it was and had taken the individual out and had him shot; at about the same time John Cleese had left the group and Mr. Idle always wondered whether the woman had assumed it to be true). 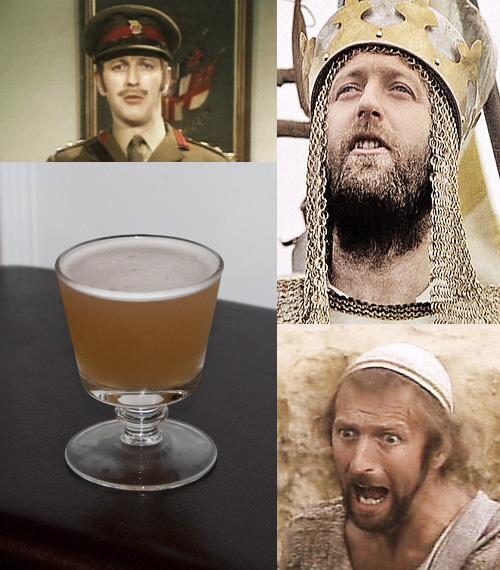 The ginger liqueur, of course, is for King Arthur in the Holy Grail and gives some more sweetness with the pineapple. The rum (went with Private Reserve here) is for Mr. Chapman’s Yellowbeard movie and adds a nice spiciness with the ginger. Byrrh, I’m almost ashamed to admit (almost) is a bad play on letters in order to get a representation of Life of Brian and the jokes about myrrh (“And thanks a lot for the gold and frankincense, er, but don’t worry too much about the myrrh next time.”). It adds some additional sweetness and bitter qualities, and I think brightens the drink up a bit. The Boker’s bitters are fully titled Dr. Adam Elmegirab’s Boker’s Bitters, and were included to tone down the sweetness slightly and for Mr. Chapman’s medical beginnings (he studied to be a doctor). The cinnamon dust is for one of the funniest Chapman bits I saw, in which he appeared posthumously. When the Pythons appeared at a comedy festival in Aspen, they brought out an urn which apparently contained Mr. Chapman’s ashes. During the interview, Terry Gilliam accidentally kicked over the urn, at which point all the Pythons attempted to “recollect” them, one even with a dustbuster. There you go. As easy as one, two, five.